The entire project stops being debuggable as far as observing variable values goes. This behavior is perfectly consistent. Without the framework import I can debug again. Since I'm on Xcode 7 beta (7A121l) and OS X 10.11 developer preview I know this could simply be a (temporary) bug. Command line Tiles are set to use the Xcode 7.0 version btw. I tried enabling modules in the framework target, made sure the deployment target is the same (10.11), disabled symbol stripping. I added a Bridging Header and #imported the TilemapKit framework in it (removing the Swift import in that case would still give me the non-debuggable app, so it doesn't seem to matter how or where I import the framework). Does anyone have a suggestion on what could cause this behavior and how I might go about fixing it - or at least how I could try to narrow down the issue? Debug info from this module will be unavailable in the debugger. How come the framework build directory changed? And why would that matter and how to fix this? PS: the same framework in a new ObjC app can be debugged just fine. I got a message from an Apple developer stating that they've observed this problem, and that it could be fixed by moving the .framework to a subfolder of the project. Apparently the module .. was built in directory error appears only if the .framework is in the same folder as the .xcodeproj aka $(PROJECT_DIR). However moving the framework to a subfolder didn't fix the issue in my case, but it's still worth a try until this gets fixed in a newer Xcode 7 beta (still occurs in beta 3). In my case this was happening because of redundant import statements in my project. My project mixes swift and objc files, so I have import statements in the bridging_header.h file. I removed the redundant import from the swift file, that seems to have fixed it. I can confirm this is happening in Xcode Version 7.0 beta 4 (7A165t). I had to remove my ObjC framework to get Debugging values to return. If removing your framework isn't an option, the print method is old-school debugging, but still works. I had this issue a while ago. In my case the Prefix.pch was beeing included inside the Bridging-Header.h. This is not a issue per so, but inside my Prefix.pch there was many C includes that make the lldb fail to import the Bridging-Header. So I removed the "#import Prefix.pch" from the Bridging-Header and copied just the "#includes" to the obj-c files that I need to use in swift. The Optimization level is not set to None for the Debug configuration. 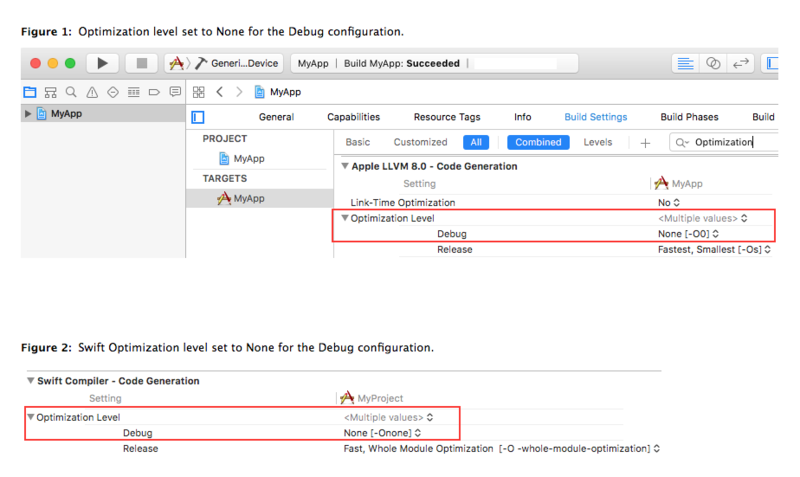 Be sure to set it to None for Objective-C apps as shown in Figure 1 and for Swift apps as shown in Figure 2. 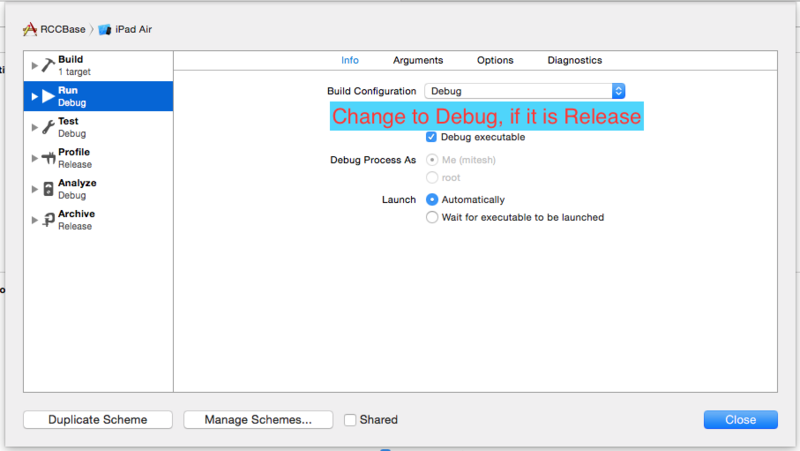 The Build Configuration pop-up menu is set to Release in the scheme editor's Run action settings pane. 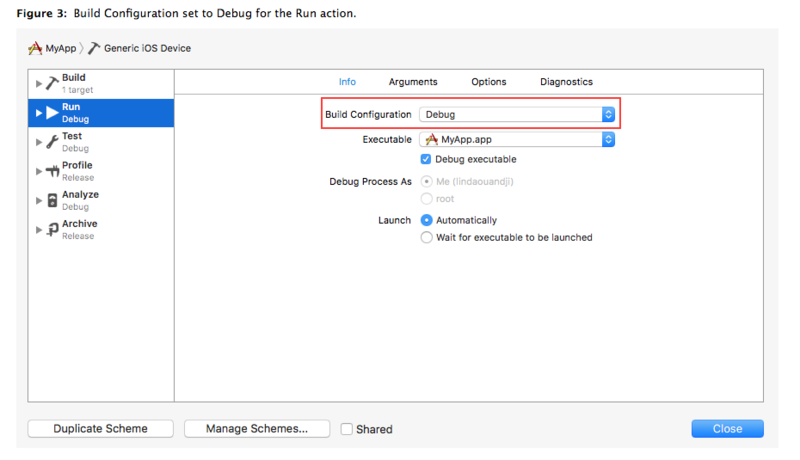 In Xcode, open the scheme editor by choosing Product > Scheme > Edit Scheme…, select the Run action for your app in the scheme actions pane, then set Build Configuration to Debug as seen in Figure 3. Go to Edit Scheme on left top corner. Not the answer you're looking for? Browse other questions tagged xcode debugging frameworks swift2 xcode7-beta2 or ask your own question.